This immediately caught my eye! Looks so delicious! I have heard of this before and heard it was actually good. Looks amazing too. I love the apple and cheese combination. This is a unique spin on that! Sounds so tasty. Will give it a go. This looks so good and the top of the bread looks so nice and crunchy. Just the way I like it. I’ll have to give it a try. Oh wow this looks delicious! I’m definitely going to have to try this recipe! Your pictures of this bread are very enticing if I say so myself. 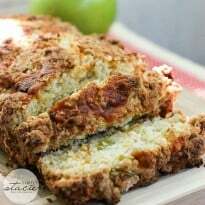 I love finding new recipes for the fall and winter and the Apple Cheddar Quick Bread looks so delicious and I love how easy it is. Have to try it soon!! I have never heard of anything like this before. I would like to try it. I need to print this out so we can have it. i have never tried apples and cheese together, this might be a good place to start! WOW! This looks yummy!! Thank you for sharing the recipe. this looks amazing! i love the combo of apple and cheddar so this is a must try! This looks so delicious. Love the combo of apples and cheddar! Omg that looks soo good! Even tho I’m horrible at cooking *sad face*, I will definitely will have to try to make this!! I wouldn’t have paired apples with cheddar in bread, but it looks good! This looks terrific – and easy! Thanks for sharing! This looks delicious. I will be making this for my family. Thanks for sharing. I definitely want to try this recipe…I just love dipping apples in cheddar fondue! Oh WOW! Stacie, I pinned this bad boy!! YUM! This sounds good. I already love cheese and apple together so I will definitely be making this soon. OMG this looks so so yummy. I cant wait to make it. I just bought apples to make dumplings with so I have all the ingredients I need for this. Thanks so much for the recipe . I pinned on pinterest too. This looks soooooooooooooooooo good and I have all the ingredients to make it. Of course apples and cheese go together well. I like to eat an apple slice with cheddar cheese. I would really like this bread. Thanks for the recipe. 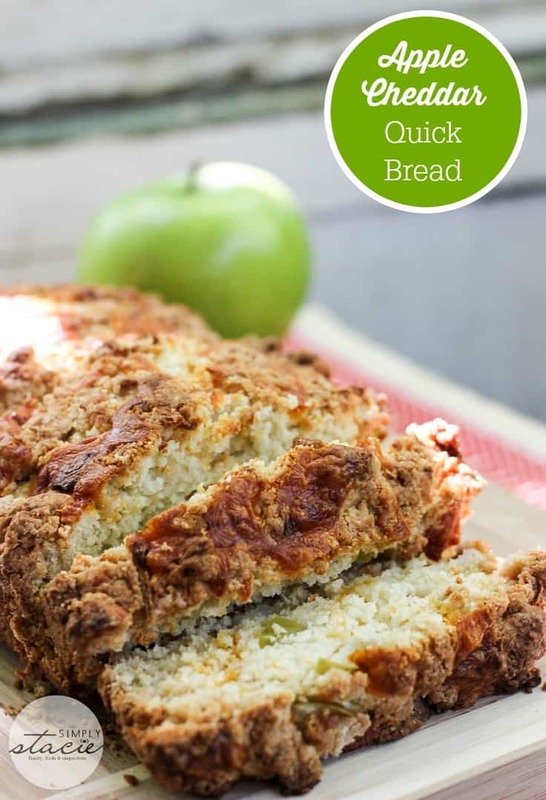 This sounds wonderful, I love Apple Bread and the Cheese will go nicely in it. It looks and sounds so appetizing. I’m pinning this to my recipes board to not lose track of it so that I can try it this fall. Thanks! Sounds yummy! I’ll have to try this one. Also stumbled and pinned to share with my readers. I don’t think apples and cheddar is a strange combination, fruit and cheese usually go together quite well. The Apple Cheddar Bread certainly looks delicious, it’s something I would definitely try, thank you for this post. I love apples and cheese together. That was always a quick snack when I was growing up. This looks so good. Want to try it soon with tall glass of milk! This looks like a wonderful recipe for fall. Yum! I made this yesterday and everyone loved it! Thanks for the recipe! Okay I got hungry just looking at this picture and reicpe I have got to try this one thanks for posting. I love apple and cheese together. This looks mouthwatering. This looks so good. I’ve got to try it. Um, Yum. This looks SO good! And I love that you don’t have to let it sit & rise! that looks so good. especially the apple and cheese together. This recipe just makes sense to me. Apple and cheddar cheese are perfect pairing! This is on my to-make list! Thanks! that look’s amazing. trying it for the holidays. That sounds GREAT. I had to copy with a pencil since I’m out of ink on my printer. I’m going to make it tomorrow. THIS looks delicious! I love apples and cheese together..
Look delicious and sounds delicious. 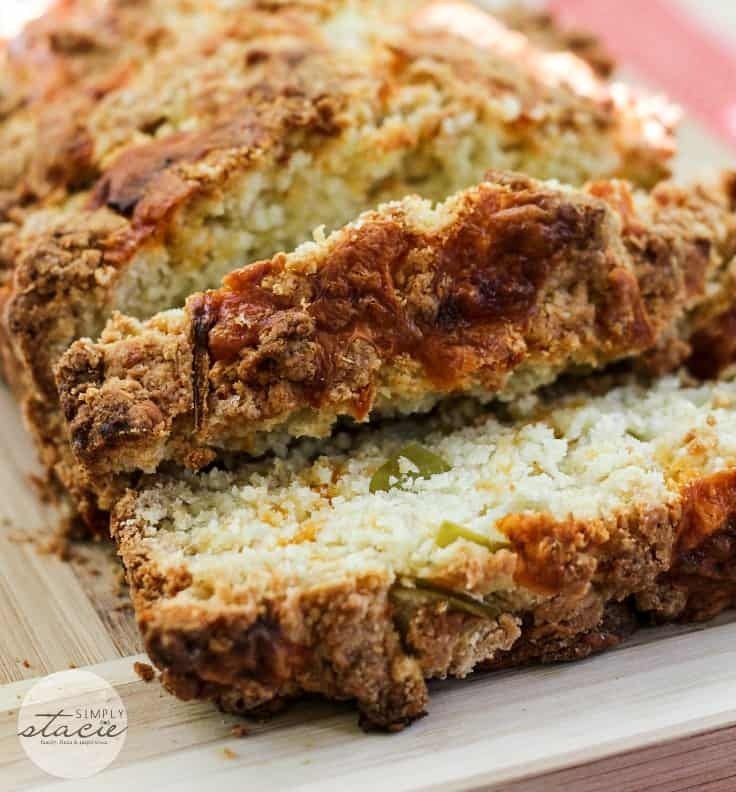 I have not tried a apple cheddar bread before. I guess it is about time I do.